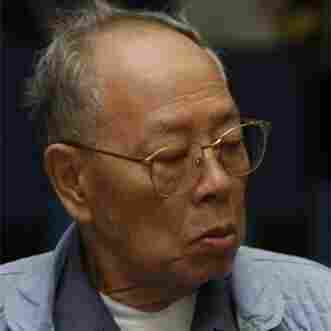 Co-Founder Of Khmer Rouge Dies; Ieng Sary Escapes Judgment For Genocide : The Two-Way An estimated 1.7 million Cambodians were killed during the Khmer Rouge's reign of terror. As "Brother Number Three" in the leadership and foreign minister, Ieng Sary allegedly convinced many Cambodians who had fled to return. Then, many were allegedly tortured and executed. The death of Ieng Sary, co-founder of the Khmer Rouge that ruled Cambodia from 1975 to 1979 and killed an estimated 1.7 million of that nation's people in the process, has dashed the hopes "among survivors and court prosecutors that he would ever be punished for his alleged war crimes," The Associated Press writes. The 87-year-old former foreign minister's death was announced Thursday by the Extraordinary Chambers in the Courts of Cambodia for the Prosecution of Crimes Committed during the Period of Democratic Kampuchea (Extraordinary Chambers or ECCC). That "Cambodian court with international participation" was created in 2005. Ieng Sary and several other former Khmer Rouge leaders were arrested in 2007. It wasn't until 2011 that his trial began. It was still underway when he was hospitalized on March 4. According to the AP, the cause of his death "was not immediately known, but he had suffered from high blood pressure and heart problems." -- "Crimes against humanity (murder, extermination, enslavement, deportation imprisonment, torture, persecution on political, racial, and religious grounds and other inhumane acts)." -- "Genocide, by killing members of the groups of Vietnamese and Cham." -- "Grave breaches of the Geneva Conventions of 1949 (willful killing, torture or inhumane treatment, willfully causing great suffering or serious injury to body or health, willfully depriving a prisoner of war or civilian the rights of fair and regular trial, unlawful deportation or unlawful confinement of a civilian)." "As foreign minister, Ieng Sary was said to have been responsible for convincing many educated Cambodians who had fled the Khmer Rouge to return to help rebuild the country. "Many were then tortured and executed as part of the purge of intellectuals." "Brother Number Two," Nuon Chea, is deputy secretary of the Communist Party of Kampuchea (the Khmer Rouge). He trial continues.